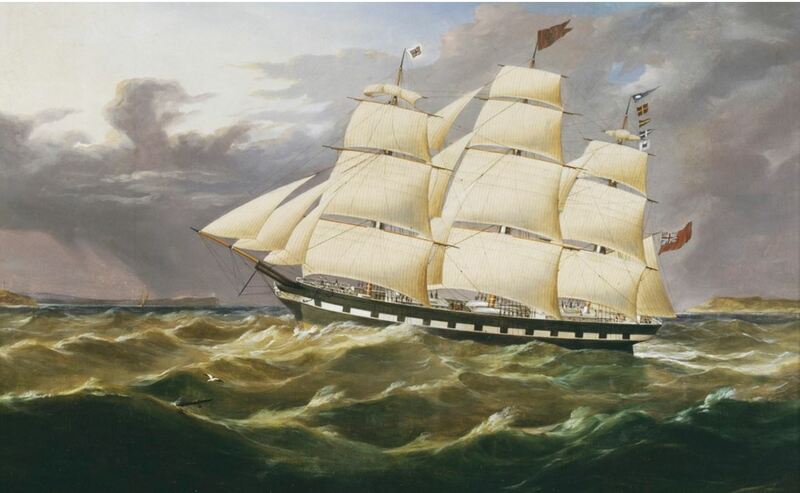 On Boxing Day 1852, a clipper ship sailed into the port of Liverpool with a banner draped from its mast declaring it “The Fastest Ship in the World”. The ship was the New Brunswick built clipper Marco Polo. 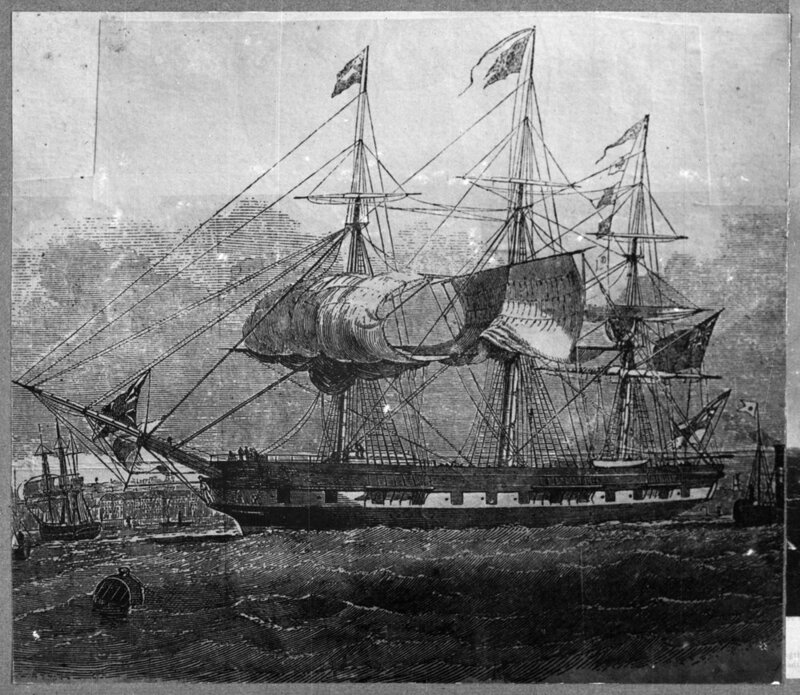 The achievement, sailing from Liverpool to Melbourne and return in 175 days, a world record at that time. At the helm, Captain James Nicol “Bully” Forbes, a colourful and fearless character of the sea and a master of navigation. MARCO POLO RETURNS TO LIVERPOOL. 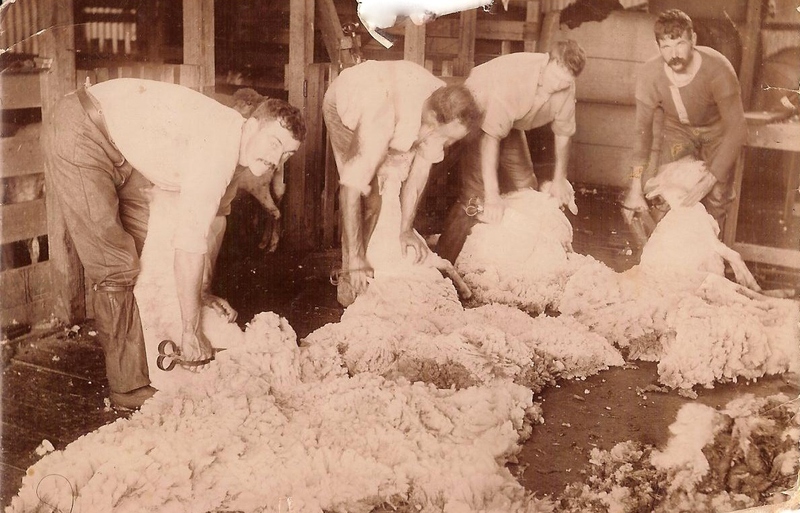 Image courtesy of the Brodie Collection, La Trobe Picture Collection, State Library of Victoria. 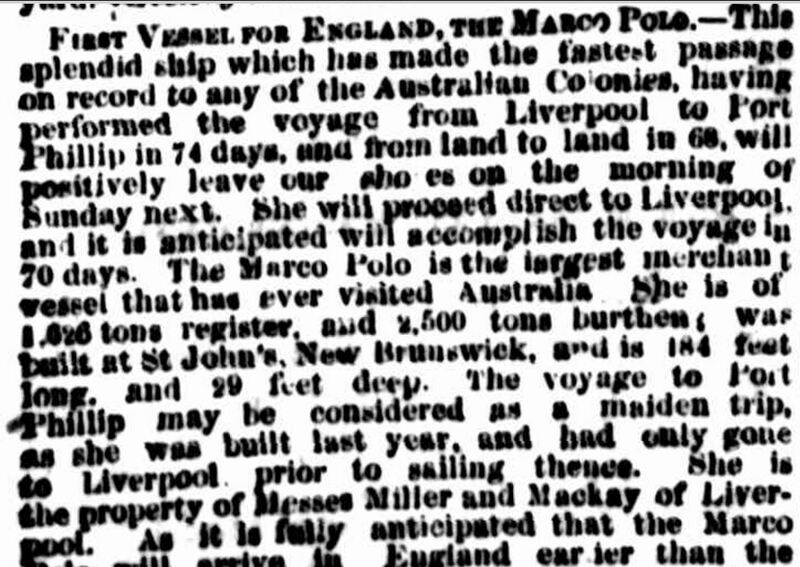 Only five months before, 888 passengers, mostly emigrants, boarded the Marco Polo at Liverpool, England for the ship’s maiden voyage to Australia. Of those, 661 were Scots including my great, great, great-grandfather Charles Hadden, his wife Agnes and sons, William and James. They had made the journey from Haddington, East Lothian, Scotland to Liverpool, to embark on a new life in Australia. In the days before the voyage, they would have stayed at the emigrant depot at Birkenhead before being loaded into the ship’s crowded steerage. The three decked ship was the largest at the time to sail to Australia and while it had rather plush fittings in some parts, for the assisted emigrants conditions were poor. The Haddens were likely to have been amidships with the other families occupying a small berth with little privacy. With the firing of a cannon, the Marco Polo set sail on 4 July 1852 with Captain “Bully” Forbes intent on sailing to Australia and return in under six months. Forbes had charted a course he was sure would cut the travel time, by way of the great circle route. This would see the ship sail south down the east coast of South America, and then steering southeast of Cape Town toward Antarctica. The path was as south as possible without getting too close to ice. It was here Forbes caught the “Roaring Forties” winds, travelling east until he was able to head north into Bass Straight. For the passengers, this meant enduring the extremes of weather. As they passed through the Equator they would have felt the incredible heat, and then freezing cold as they moved into the “Roaring Forties” and “Howling Fifties”. Also, disease particularly measles was rife below deck. The crowded conditions at the emigrant depot and then on the ship had seen its rapid spread. Of the 327 children on board, fifty-two died along with two adults. When the Marco Polo sailed into Hobson’s Bay on 18 September 1852, the Victorian gold rush was in full swing and Forbes’ greatest concern was keeping his crew on board the ship. This wasn’t helped when coming into dock as boats surrounded the clipper, reportedly throwing small nuggets on the decks. Other ships’ captains told of not being able to get crew no matter how high the wages offered. Forty or so ships were causing a log jam in Hobsons Bay. Their crews had caught “gold fever” and abandoned their posts. 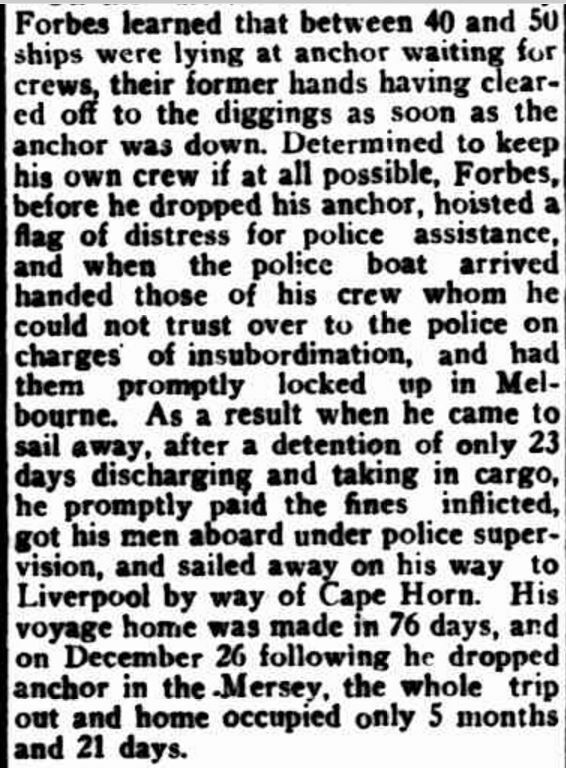 So resolute to return to Liverpool quickly, Forbes had is own crew imprisoned for insubordination and when it was time to leave for England, he paid their fines and returned them to the ship. Despite his best efforts, the time spent in port was twenty-four days, although without Forbes’ ingenuity it may have been longer. Seventy-six days later the ship was sailing back up the Mersey, to dock at Liverpool, the world record journey complete. The feat saw “Bully” Forbes keep the captaincy of the Marco Polo for another voyage to Australia in 1853 with 648 passengers, reduced from the previous voyage because of the learned danger of overcrowding. The ship was extensively renovated before the second voyage and described at the time as an equal to a floating Crystal Palace. The Marco Polo and Forbes brought over 1500 immigrants to Victoria in the two trips. Forbes was rewarded with the captaincy of the Lightning which he sailed to Australia in 1854. From there he captained several other ships until his sea days ended in 1866. He died in 1874 at only fifty-two years old but he had ensured his name would be remembered in maritime history. 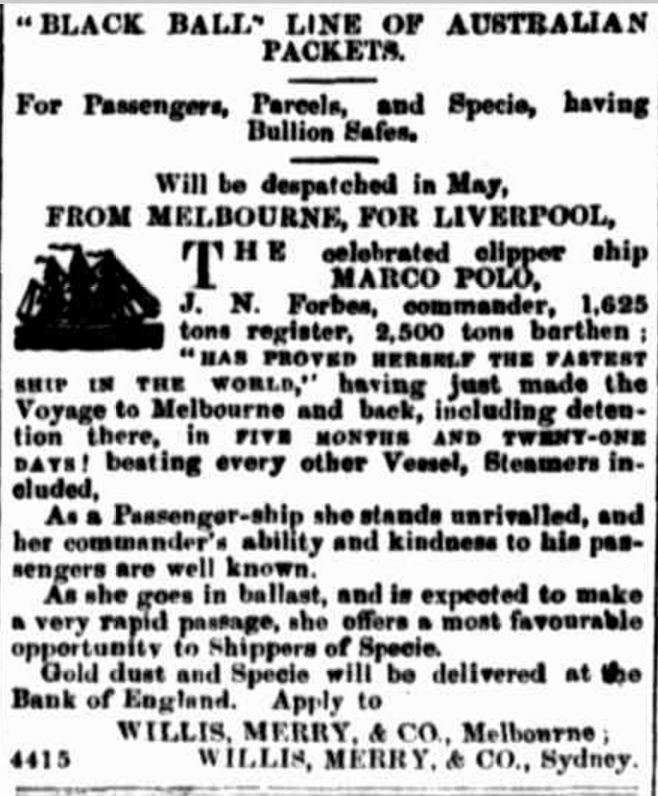 The Marco Polo completed the round trip to Australia a total of twenty-five times in the fifteen years after the first voyage bringing around 150,000 immigrants to Victoria. From 1867, she was a cargo ship until 1883 when she was driven on shore at Prince Edward Island, Canada when a bad leak was found during a cargo run. A sad end for a ship that safely carried thousands of people to a new life in Australia. In New Brunswick, Canada, the Marco Polo is remembered proudly and The Marco Polo Project is overseeing the building of a replica ship. The Marco Polo is not as celebrated in Australia, but many Australians today would have had ancestors arrive here thanks to the speedy clipper. The Haddens made it through their speedy voyage on the Marco Polo. Records show they left the Marco Polo at Hobsons Bay in September 1852 and made their own way to Melbourne, most likely to the Canvas Town in South Melbourne, a “tent city” for the thousands of immigrants. William obtained work on properties owned by the Chirnsides at Cavendish, Mount William, and Carranballac before returning to Cavendish by 1864 and settling.